It’s not a crossword. It’s not some extreme version of tic-tac-toe. So what is KENKEN and where did it come from? 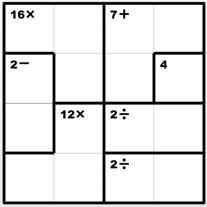 Simply put, it’s a grid-based numerical puzzle that uses the basic math operations—addition, subtraction, multiplication, and division—while also challenging your logic and problem-solving skills. Go to http://www.kenkenpuzzle.com/play_now and try a KENKEN puzzle online! NOTE: This only works on a computer that has Flash. If you’re on your iPad, try clicking this link and downloading some and printing them out. Here’s another link to download and print more KenKen puzzles. Post a comment about something new you learned. Maybe post a challenge you experienced when trying to solve a KENKEN. Completing 5 Math Minutes earns you a Math Minute Maniac badge! Email the EY Coordinator at your building when you’ve completed 5 Math Minutes this year to claim your badge! Wow ken ken puzzles really make you think! It is harder then you think. Ken ken puzzles are hard at first, but if you think, they are easy. It gets really hard when you get to 9 x 9 grid . And I found a ken ken app! Awesome Jack! I had another student find an app and I need to download it. It’s really addicting – like sudoku. I learned that a ken ken puzzle is like a sudoku puzzle.